A few years back, I worked at a lovely little restaurant called the B Line. We made all our desserts from scratch, including berry pies, gorgeous layered cakes, and a super rich single portion German chocolate cake that was somehow large enough for two people to share. We also did good business for breakfast and brunch, and the weekend was specially reserved for our super fluffy homemade biscuits. I can’t tell you how many of those I ate fresh from the oven, you know, for quality control purposes *wink wink*. My favorite way to eat them was just plain, or sometimes ripped in two and drizzled with a bit of honey. I still love those biscuits, even though it’s been a long while since I’ve eaten them. These buttermilk biscuits are my homage to those towering, soft and fluffy biscuits with their crunchy butter-slicked tops, and the countless hours I spent mixing, cutting, baking, and eating them in my time at the B Line. Stick around next weekend for a delicious recipe that puts these biscuits front and center! Preheat oven to 350 degrees. Line two sheet pans with parchment paper and set aside. In a large bowl, combine flour, baking powder, baking soda, salt, pepper, and sugar. Whisk well to incorporate. Place cold chopped butter on top and, using your hands (my preferred method), squeeze and work the butter into the dry ingredients. You’re aiming for a finished mixture that looks fluffy and with very small pieces of butter, with most of it worked into the dry ingredients. No big chunks of butter allowed! Once the butter is well mixed, add the buttermilk. Using a spatula or your hands once again, gently stir and fold the buttermilk in, just until the liquid is incorporated. It’s okay if there’s a little bit of dry mix still hanging around, it will get mixed in while rolling and cutting the biscuits. On a well-floured surface, place half of the biscuit dough. With floured hands, lightly pat out the dough to a thickness of about 1/2 – 1 inch. Cut out biscuits using a 4 inch round cutter and place 6 on each lined sheet pan. Continue patting out and cutting the second portion of dough, then gather up the scraps from both sections and continue cutting more until all the dough has been used. Melt a bit more butter in a small dish and brush the tops of the biscuits with the melted butter. Place the pans in the oven and bake at 350 for 13 minutes. Spin the pans around and swap their rack positions, and continue baking for another 12 minutes. 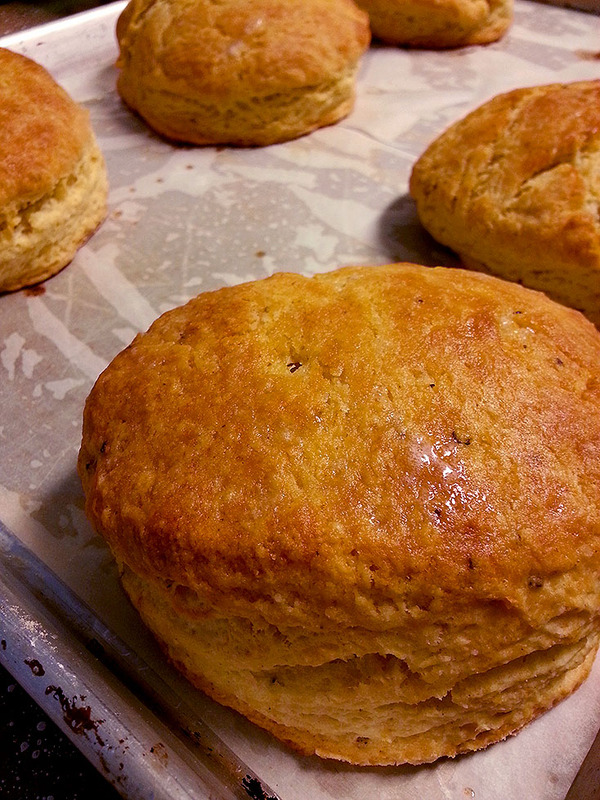 The biscuits should be golden brown on top and nice and tall. From here, you can do whatever you’d like with them! As I mentioned, they’re great with honey and a little more butter slathered on, or even a thick layer of berry jam. Or, you can wait to make them until next Sunday when I’ll be showing you a lovely make-ahead breakfast sandwich that will provide you with a tasty, hot breakfast for over a week! Either way, they’re delicious. These biscuits store well in an airtight container at room temperature for up to 2 days, or frozen in zip-top bags for several weeks or longer. To reheat them from room temperature, pop them back into a 350 degree oven on a sheet pan until they’re crispy on the outside and hot on the inside, about 8-10 minutes. To reheat from frozen, do the same as you would if they were room temperature, but wrap all the biscuits up in a single layer in a packet of aluminum foil to prevent burning on the outside.